Our second ship "ABN Sukapha" joined "ABN Charaidew" in Assam in October 2006. We have respected the fragile environment of the River Brahmaputra and resisted the temptation to build a larger ship. Our maximum group size of 24 is well-matched to the numbers of riding elephants available in National Parks along the valley, while the need to use jeeps to access the river beaches also limits group size. The result is an ideal number for fostering a friendly house-party atmosphere on board. For "ABN Sukapha" we kept as closely as possible to the design of "ABN Charaidew", both from popular demand and reasons of practicality, thereby retaining many of the features which make our original vessel so popular, but also adding a small spa. The overall dimensions of "ABN Sukapha" are similiar to "ABN Charaidew" and she is also powered by twin engines. Her 12 cabins are equally roomy and we have retained the much appreciated comfortable chairs by the picture windows for relaxing in privacy. The spacious saloon has French windows opening onto a front balcony deck and the dinning room again has glass doors down each side. Specially-commissioned furniture and locally-woven soft furnishings match those on "ABN Charaidew". Again, the large sundeck offers the opportunity to relax on comfortable cane rattan chairs and sunloungers. 7 Night Cruise sailing from Calcutta to Farakka abard ABN Sukapha. 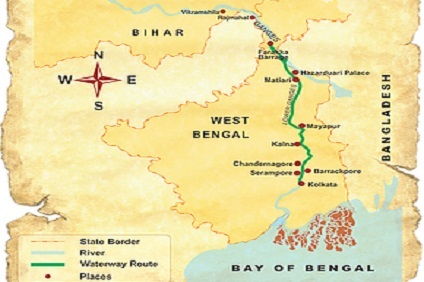 7 Night Cruise sailing from Farraka to Calcutta aboard ABN Sukapha. 3 Night Cruise sailing from Kolkata roundtrip aboard ABN Sukapha. 2 upper deck cabins measure 4.5m x 3.5m and are all en suite with air-conditioning. Cabins have a double bed, all with under-bed storage for clothes and suitcases. All cabins have built-in wardrobes with hanging and shelf space, and also contain individual programmable electronic safes. Bathrooms have shaver sockets, a hair drier, and a selection of Boutique toiletries. All cabins have large windows with sliding glass panes and fly-screens, and have two comfortable rattan armchairs which are well-placed for admiring the passing scenery. Mineral water is provided in your cabin and is replenished daily. 10 upper deck cabins measure 4.5m x 3.5m and are all en suite with air-conditioning. Cabins have twin-bedded cabins, all with under-bed storage for clothes and suitcases. All cabins have built-in wardrobes with hanging and shelf space, and also contain individual programmable electronic safes. Bathrooms have shaver sockets, a hair drier, and a selection of Boutique toiletries. All cabins have large windows with sliding glass panes and fly-screens, and have two comfortable rattan armchairs which are well-placed for admiring the passing scenery. Mineral water is provided in your cabin and is replenished daily.